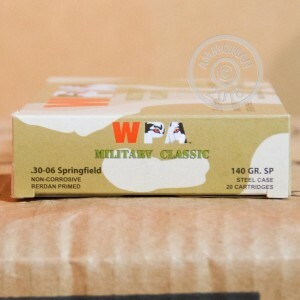 These .30-06 Springfield cartridges are a cost-effective way to put venison on the table or get some target practice in. 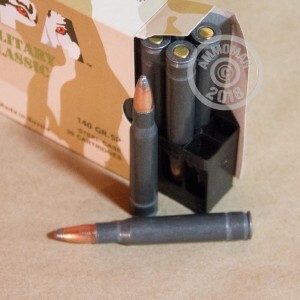 Each round in this box of 20 fires a light 140 grain soft point bullet design to expand upon contact with an animal while producing minimal fragmentation. 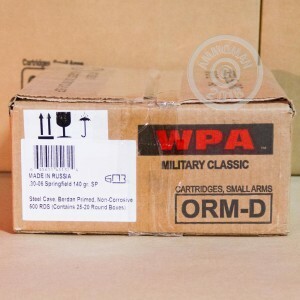 This ammunition is made in Russia and imported by Wolf. It uses non-corrosive Berdan primers and non-reloadable steel cases. Save big at AmmoMan.com with free shipping for all orders over $99!